On February 4, 2019, after celebrating Holy Mass in private, at 11.50 local time (8.50 in Rome), Pope Francis transferred by car to the Presidential Palace for the welcome ceremony and official visit to the Crown Prince, His Highness Sheikh Mohammed bin Zayed Al Nahyan. Upon arrival, the Pope’s car was escorted by presidential guards on horseback to the main entrance of the Palace. 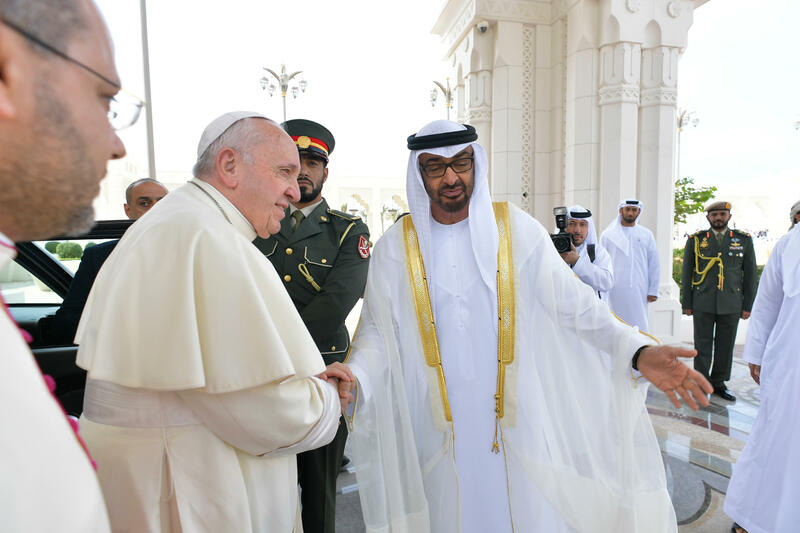 The Holy Father was then welcomed by the Crown Prince, His Highness Sheikh Mohammed bin Zayed Al Nahyan. After the military honors and the performance of the anthems, the presentation of the respective delegations took place. The Crown Prince then accompanied Pope Francis to the room where, at 12.20 local time (9.20 in Rome), a private meeting was held, lasting around twenty minutes. At the end of the meeting, after the signing of the Book of Honour and the exchange of gifts, the Holy Father took leave of the Crown Prince and returned to Al Mushrif Palace.